Learn how to reverse decoupage – a process where you apply the decoupage material on the inside of an object, rather than the outside, to create this beautiful home accent. Drop your picture into a tray of water. It will curl up and then flatten out. As soon as it flattens, gently remove the picture from the water and pat dry with a paper towel. This technique will relax the paper and prevent it from wrinkling when you apply it to your glass. Apply glue to the full surface of the front of the image and place on the inside of the vase, so that the picture shows through the glass). Apply as many images as desired; you may also overlap pictures if you wish. Once your image is in place, apply an even coat of glue over the back of the image and allow to dry completely. Now that all the glue is dry, remove any excess glue sitting on the glass using a small amount of window cleaner. The glue will remove easily with a paper towel dipped in glass cleaner. Allow the glass vase to dry. Before applying my cream colour paint, I sponged taupe coloured paint on the inside of the vase. Use a sea sponge for best results and dab gently over the entire inside of the vase. Allow this paint to dry completely before moving to the next step. 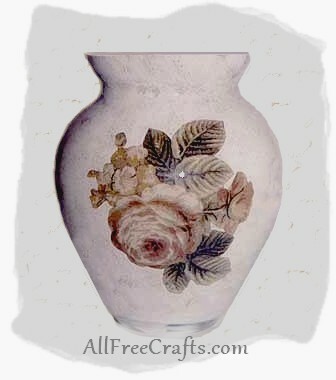 Paint the entire interior area of the vase with cream coloured paint. Allow to dry at least 24 hours. Repeat painting until you can no longer see through the paint. Depending on the paint you use, this could take anywhere from three to five coats of paint. Heat set the paint, if required by manufacturer instructions. Because this vase is painted on the inside, you cannot fill it with water, but you can fill a glass with water and insert inside the vase for fresh floral arrangements.